This is the 2nd blog on 11.1.2.3 new features. Some of the features in 11.1.2.3 are quite exciting and I started exploring some of them (if not all). First one was @CREATEBLOCK and the next one was about SET RUNTIMESUBVARS. I’m in the process of creating a jar/exe where you can get user inputs and then run the calc script. (Currently this new function is included in the API to prompt a user for a variable but so far this has not been implemented in any product (MaxL, SmartView, CalcManager, EAS – none of them yet). 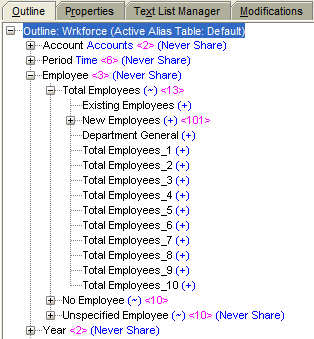 This post is about metadata addition in Planning from Smart View and “on the fly member addition”. You can install a Smart View add-in for Planning Administration which will provide you an interface to edit Dimensions in Smart View. You can now modify members without logging into Planning Web. Read about how to use it here. It is a fairly simple process to add members. You can login to the Planning Application and once you install Add-in for Planning Administration, you’ll see a new member under the application tree “Dimensions”. 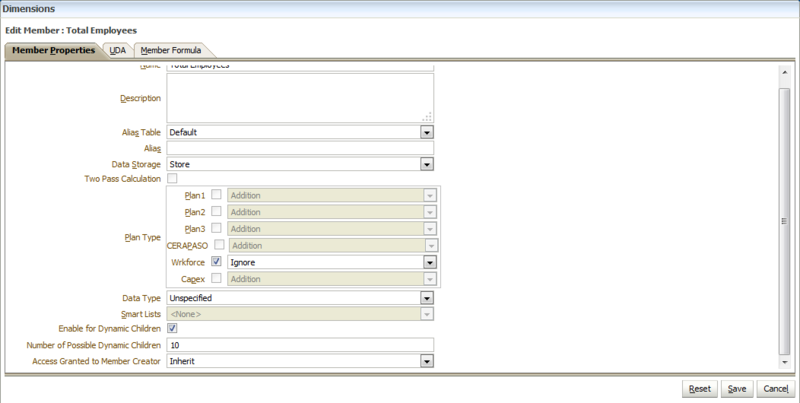 Double click on a dimension, so that it creates an ad-hoc sheet. You can enter new member/members in Column A. You can refresh the sheet, It will ask you to refresh if you try submitting without refresh, you can change the setting by adding a property value, check Selecting the Add Mode within Planning Application Properties. The new member/members will be added (all new members will be suffixed with (*), you can change it by adding SMART_VIEW_MD_NEW_MEMBER_SUFFIX) to the Dimension. I couldn’t make it work after logging off from browsers and Smart View. I even recycled the services and nothing was working. Then I thought of expanding MD (like METADATA) and nothing was working. Last option, Google (of-course) took me to John Goodwin’s blog. So the properties are SMART_VIEW_DIMENSION_EDITOR_NEW_MEMBER_SUFFIX and SMART_VIEW_DIMENSION_EDITOR_PARITY_MODE. First submit member so that it comes under Root member – dimension. Change to different parent and perform a second submit will move it to different member. 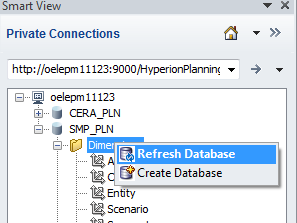 You can now create/refresh database from Smart View. Now lets check on the fly member addition. so I tried adding a parent to allow Dynamic children in Workforce. Now refresh Essbase so that it creates the place holders. I can see the place holders in Essbase not in Planning. Now change a calc manager rule to allow dynamic members. 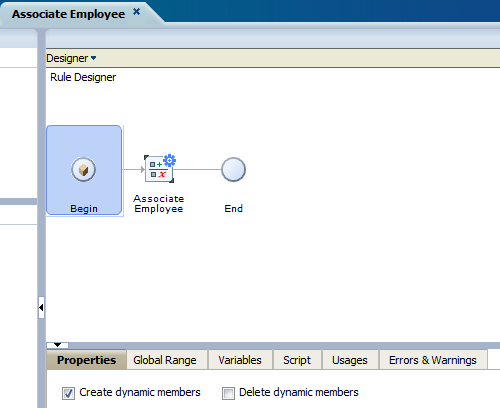 An RTP variable is created with dynamic parent member. It throws an error which says the member does not exist. So is there no “on the fly member”. I’ll update you all if I find something on it. I tested same at my end, two quick questions , 1 I have attributes assigned to one of the dimension and i am not able to find an option to change attributes ( only option i see is UDA), any thoughts ? 2. For this function to use, user must have admin access , correct ? @Dhaval, I have reached a similar conclusion. I can't seem to find a way to update Attribute Dimensions, only UDAs. Seems to be a limitation at this juncture. I used the Outline Load Utility to update the Account Dimension with the designated Attributes.